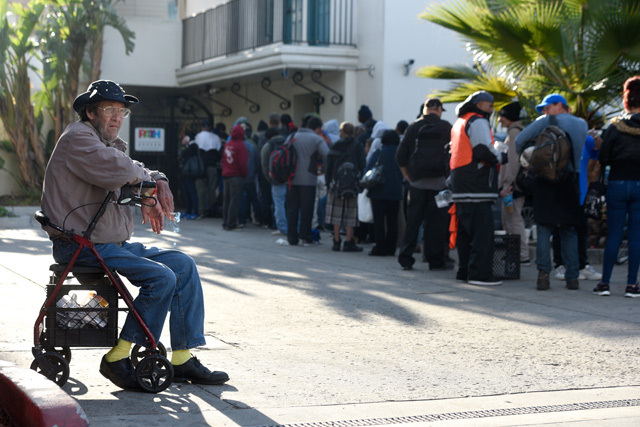 Nearly 400 people volunteered to count homeless people throughout Santa Barbara County last Thursday as part of the county’s third biannual homeless census, and even more showed up the day of the event. Such tabulations are required by the federal Department of Health and Human Services in exchange for federal funding for homeless programs. The results of the count won’t be ready for several weeks, but in previous years, the number was about 1,450. This year’s count differed from the previous two in that teams of volunteers were dispatched to a handful of locations known to be frequented by the homeless, like Santa Barbara’s Alameda Park, in the mid-afternoon. In prior counts, teams of census takers were dispatched before dawn into places homeless were thought to be. This year’s questionnaire was notably briefer, as well, dispensing with lengthy interrogatories about substance abuse, sexual histories, and medical ailments. Those consenting to be questioned received fresh clean socks and a gift certificate to Starbucks. Santa Barbara, like many coastal communities throughout Southern California, is struggling with what to do with people who have no place to go. On one hand, the AmeriCorps program has funded 35 part-time outreach workers countywide to community organizations seeking to connect the homeless, services, and shelter. On the flip side, the City of Santa Barbara is about to start enforcing a new ordinance that bans RVs from city streets altogether. But because that ordinance is based on the size of the vehicle, many other vehicles ​— ​Sprinters and the like ​— ​will find themselves suddenly outlawed, too.